Where have pig's tails been all my life? These bony pig parts - featured in the third course of my New Year's Eve dinner at B&O American Brasserie - are right up my culinary alley. Full of bones, tendon, and gelatinous skin, pig's tails are something that my Polish, offal-loving mother and grandmother would have adored; I am surprised that they were never on our dinner table. I checked out a couple of recipes online and decided that pig's tail was easy enough to cook that I could wing it. Chichi Wang's soy-braised and fried pig's tails inspired me to use an Asian flavor palette and a vinegary dipping sauce to cut the fatty lusciousness of the meat. Red-braising, with it's star anise sweetness, seemed perfect. While I love the succulent meat and other goodies that hang around the boniest parts of animals, Mr Minx is not as big a fan. For him, I bought a package of neck bones, which have much more meat and fewer gelatinous bits. And are shockingly delicious. Where have neck bones been all my life? 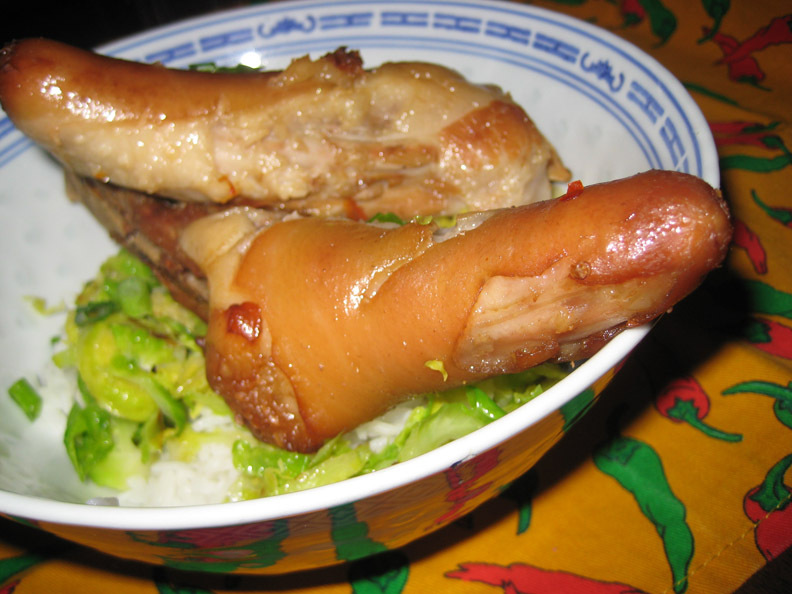 Served with some white rice and a simple stir-fry of sliced Brussels sprouts (because that's what we had), these pig parts were finger-lickin' good, if a bit obscene looking. Remove pot from the heat, remove and rinse pig parts, drain liquid, clean the pot of any debris, then return the tails to the pot. Cover with cold water. Add garlic, brown sugar, soy, chili paste or red pepper flakes, and star anise and bring to a boil. Turn heat down and simmer for between 2-3 hours, or until the tails are very tender. Remove from heat. Can refrigerate in the braising liquid up to overnight until ready to use. Preheat the oven to 375F. Line a roasting pan with aluminum foil. Remove pig parts from braising liquid, pat dry, and place them in the roasting pan. Roast the parts for 30 to 40 minutes, until the tails pop and sizzle and the skin browns. While pig is roasting, strain braising liquid and place in a large saucepan. Bring to a boil over high heat and cook until reduced to about one cup. In small bowls or ramekins, mix equal parts of soy sauce and vinegar (about 1 T each per diner). Stir in a couple tablespoons of reduced braising liquid. Use as a dip for the meat.